I would like to say a massive thank you to Tom Curtain from Katherine Outback Experience for the stellar job he did breaking in my filly, Diva. As everyone knows, Diva is my world, so having a good start to her ridden life was extremely important to me. Well, Tom has created one of the softest horses I've ever had the pleasure to sit on. She isn't affected when my unsteady legs bounce around, nor does she freak out when I fall on her neck (yes, that has happened already). I honestly feel like she is to good a horse for me.... Thank you so much Tom, I can't say enough about you and the work you do - no need to really, it speaks for itself! Tom has just finished breaking a 3rd horse in for me. All big performance Warmbloods. He has gone above and beyond every time, the horses come back confident and trusting and are a pleasure to continue working with. He’s a true horseman that is passionate and understanding of the horses. We are very lucky to have him in the NT. Tom Curtain has professionally trained over 2,000 horses over the last 20 years. Tom's affinity with horses started as a child growing up on the family farm in Kumbia, Queensland. He started his first horse at the age of twelve under the guidance of renown horseman Hurley Toomey. Tom and his four brothers built a large arena which was then used to train horses during school holidays for family and friends around the local district. Tom went on to study a Batchelor of Applied Animal Science specialising in Beef Cattle Production at the University of Queensland Gatton Campus. After graduating, Tom packed his bags and headed for the Northern Territory where he landed a job in the stockcamp at Mount Sanford Station, 600km south of Katherine. After a season in the stockcamp of mustering and processing brahman cattle, Tom was moved to the horse training team where he worked along side Martin Oakes. The team trained around 100 horses a year for the Heytesbury Cattle Company. It was here Tom started experimenting with different natural horsemanship methods and analysing the psychology of horses. From here Tom moved into contract horse-starting and would move from station to station every three weeks throughout the Northern Territory and Queensland. 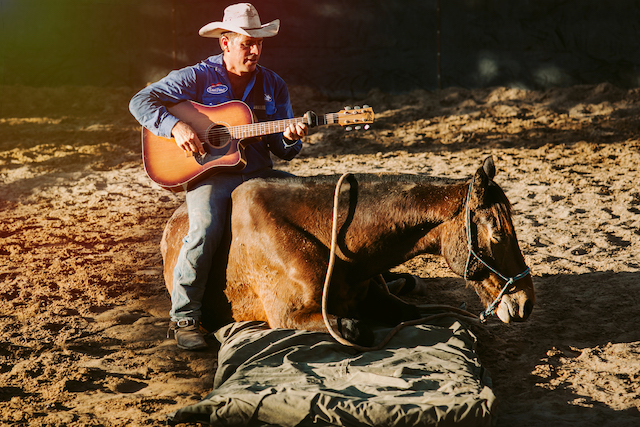 Life on the road was taking its toll so he purchased a property on the outskirts of Katherine with a vision to build a horse training facility for the stations to send horses to him to train. This was going well until the 2011 Live Beef Export Ban. Overnight budgets were cut on stations which meant they could not afford for horses to be trained and Tom was out of work. They say when one door closes, another opens. This was the case for Tom, leading to the launch of Katherine Outback Experience in 2013. The outback show celebrates life on the land through real horse starting and working dog demonstrations. In 2013 Tom won the Young Guns Division of the National Colt Starting Championship . Throughout his career he has won and placed in many significant campdrafts and challenges. Among his career highlights was placing 4th in the prestigious stallions drafts at the Warwick Gold Cup on his stallion Acres of Ra. Winner of numerous Campdrafts, Challenges and Top Cut Outs, Ra is super cowy with an exceptionally trainable mind and beautiful temperament. His progeny are just starting to excel in the campdraft and show arenas. His renowned imported QH/ ASH registered sire 'Acres Destiny' has had a significant impact on the Australian performance horse industry. We are located just 6kms from the centre of Katherine, Northern Territory. We are a fully operational horse-training facility. We are planning to build a large shelter over the arenas in November 2018. Our venue is available to hire for corporate and private events. From a young age Tom was fascinated by working dogs, their natural instinct to herd livestock and their willingness to please. Their ability to muster cattle inspired Tom to study and understand more about these amazing and highly intelligent animals. Although always learning, he has a unique talent when it comes to training working dogs. He has developed his own method that focusses on their strengths to build trust and confidence when working as a team to muster livestock. We breed, train and sell working dogs for Australia-wide. We pride ourselves with superior bloodlines of Border Collies. Our Working Dogs are a vital part of our Katherine Outback Experience show and our family. They love their morning and evening runs as well as the attention they receive from visitors to the show. The Team is constantly changing as younger pups move up the ranks and older dogs move on to working life on cattle and sheep stations throughout Australia.